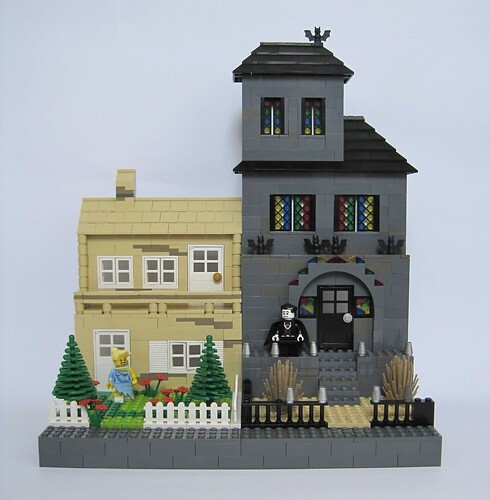 Brick Town Talk: There Goes the Neighborhood - LEGO Town, Architecture, Building Tips, Inspiration Ideas, and more! Mismatch Lane - (BTT) Sometimes the phrase "The grass is always greener on the other side of the fence" is said as a way to remind people that even though others seem to have a better life when viewed from afar, it is all too easy to ignore the negatives that go along with it. Other times it loses its status as proverb to become a simple factual statement about how much superior your neighbors lawn care is to your own. The look of the townhouses themselves are as different as the grass that fronts them, each with a bunch of little details that reveals a lot about the people who call them home.